September 1583. Ten months before the English appear at Roanoke Island. 17-year-old Alsoomse desires freedom to doubt, discover, aspire without tribal hindrance. 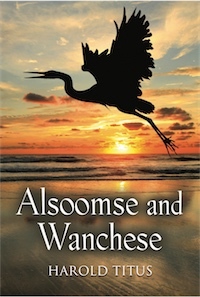 Self-willed 19-year-old Wanchese seeks to become one of his mananatowick's essential men. Each abhors injustice, dangerously opposes it. September 1583. Roanoke Island. 17-year-old Alsoomse and 19-year-old Wanchese, sister and brother -- strong-willed, quick to oppose injustices – are about to endure a series of events that will test their commitment to realize ambitious goals that endanger their lives and the welfare of individuals close to them. Wanchese's short-temper and quest to prove himself worthy of his deceased father's expectations lead him several times into mortal combat: twice on a trading mission and several times when his tribe attacks its worst enemy. Standing in his way to achieve high status as a warrior is the tribal war chief, Andacon, whose enmity Wanchese incited early in the novel. Alsoomse pushes continuously against tribal convention, the imposed role of women, and the dictatorial authority of men, rulers and priests. Her outspokenness causes her great hardship during her weroansqua's tribal visit to Croatoan and much later when she unwittingly challenges religious belief. Evil, personified by Askook, brother of the tribe's weroansqua, disrupts continuously the well-being of the main characters and their friends. English interest in colonization is narrated intermittently. Explorers and Algonquians interact at the story's end. Harold Titus graduated from UCLA with a bachelor's degree in history. He taught intermediate school English, American history, and a drama elective many years in Orinda, California. He coached many of the school's boys’ and girls’ sports teams. He is the author of Crossing the River, a historical novel about English and American participants in the first two battles of the American Revolution. He lives with his wife on the central Oregon coast.